in Mt. Helix Academy’s PE program. Mt. Helix Academy students receive Physical Education instruction daily. We are eager to develop coordination and fitness, and we also have a goal to develop in our students an understanding of the importance of physical fitness to their long-term health and well-being. 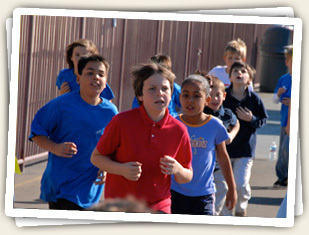 We encourage our students to commit to maintaining their physical fitness throughout their lives. To help them, we introduce our students to a variety of physical leisure activities that they can continue to enjoy long after they leave Mt. Helix Academy. The Physical Education Program at Mt. Helix Academy emphasizes the development of motor skills, movement knowledge, and fitness, but we also emphasize social and inter-personal skills using the research-based SPARK Physical Education curriculum developed at San Diego State University. Students are taught to enjoy and seek out physical activity, to develop and maintain physical fitness, and to develop a variety of basic movement and manipulative skills so that they will experience success and confidence during physical activity pursuits. In addition, students are taught to get along with others in movement environments by sharing space and equipment and demonstrating the “golden rule” of competition — be a good sport, and interact cooperatively with peers.